As I was making this delicious pancake creation I thought to myself… why haven’t I made these until now? A pancake swirled with cinnamon sugar and an amazing cream cheese glaze on top. Doesn’t get much better than that! I knew my kids would just go nuts over these. So I doubled the recipe and made a big batch. I am going to freeze some for my boys so they can be heated up before school. I know best mom ever! Heres the problem, only 3 made them in the freezer. They were so amazing my boys couldn’t get enough! Then my boys wanted a bedtime snack and heated up the rest. So I am left with zero. Thats ok though. It gives me an excuse to make them again. My boys said they were the best thing ever. They especially loved the cream cheese glaze on top! A delicious cinnamon roll in the form of a pancake that the whole family will love! To make the cinnamon filling: Combine brown sugar, melted butter, and cinnamon in a medium size bowl. Scoop into a baggie and set aside. For the glaze: In a small pan melt the butter over low heat. Whisk together the cream cheese, vanilla and powdered sugar. Take off of the heat and set aside until ready to use on pancakes. To make the pancakes: Combine flour, baking powder and salt. Whisk together the milk, egg, and oil. Heat skillet to medium low. Once preheated, spray with non-stick spray. Add about ½ cup of the batter to the skillet. Wait until bubbles start to form. Snip the corner of the cinnamon filling, and create a swirl pattern in the center of the pancake as pictured above. See notes. Be careful not to get it too close to the edge. With a wide metal spatula flip the pancake over and continue cooking for an additional 1-2 minutes until golden brown. Wipe out the pan each time and repeat with the remaining batter. Warm the glaze if needed and drizzle over pancakes. * Before using the cinnamon filling mixture to swirl on top of the pancakes, open up the bag and restir to make sure that the butter is fully incorporated. Nice to meet a fellow LDS foodie! So glad I found your site – GORGEOUS stuff!! Gonna make these for my son’s birthday! OMG!!!! These look fabulous. About how many does the recipe make? These look utterly brilliant!! I can’t wait to try them. Oh my word! Where have these been all my life?? I want to come over for breakfast! Yeah, those wouldn’t make it to our freezer either! Yum!!! Oh my husband and boys would LOVE these! I definitely make them as a surprise soon! Why I have I never thought of this before? These are on my list to make asap! DEE-LISH! I made a couple as instructed then switched to a thin layer of pancake batter followed by a swirl of the cinnamon mixture then I topped it off with another thin layer of pancake batter to seal in the cin/sugar mix. Made a huge (!) difference in the burning/messy cinnamon sugar. Will def make again. FOR ONCE, someone has actually made the recipe before leaving a reply! Not to sound rude, but I’m much more interested in hearing if the recipe turned out than how yummy it LOOKS. I wish I would have read this tip before making the pancakes. My cinnamon filling melted out of my pancakes making a huge mess in the pan and leaving big trenches in my pancakes. For my second batch, I used less of the filling and tried to cover it with batter but didn’t have much more success. Two thin layers of batter is a good suggestion. It is the recipe for cinnamon filling that you make. The brown sugar, cinnamon and butter. I made these and they were awesome. I used my own pancake recipe and can frosting that I nuked. I cooked them on a griddle and had no problems with them sticking when flipped. Absolutely amazing. Will be making these quite often here. Thanks foa an awesome new recipe. I just made these for my husband as a holiday treat. They got rave reviews, and as a bonus, my house now smells just phenomenal! You’re a recipe genius! My family thought these were great. Thank you for making me a homemaker hero. I’ve made these twice and they are amazing!! Followed recipe exactly. These are just amazing!! I’m a big fan of pancakes, and a huge fan of cinnamon rolls, so when I found this recipe I knew I would love them. I was right!! Served them to house guests and they were a big hit. These will be served again, next time we have overnight guests, or earlier! Made these for a friend’s birthday the other day and they turned out great! Only problem I had was that the cinnamon swirl didn’t seem to stay on/in the pancake very well when that side was cooked. I ended up adding a little more to each one after they came off the griddle, but need to figure out a way to get a little more of the cinnamon sugar flavor next time. Suggestions? These were as good or better than any cinnamon roll I’ve ever eaten and I am a cinnamon roll lover. I would recommend using a measuring cup or something with a small pour spout to pour the cinnamon mixture onto the batter. The baggie was VERY difficult to work with. Also, I used salted margarine and it worked just fine. These were as good or better than any cinnamon roll I’ve ever eaten and I am a cinnamon roll lover. However, I would recommend using a measuring cup or something with a small pour spout to pour the cinnamon mixture onto the batter. The baggie was VERY difficult to work with. Also, I used salted margarine and it worked just fine. I made the cinnamon filling as mentioned above but mine came out really liquidy so I couldn’t make a swirl..Do you know what I could’ve done wrong?? My 17 yr old daughter made these for Father’s Day today…My husband LOVES Bob Evans’ cinn. roll pancakes and these were so amazing! He said they were better! Thanks so much for sharing! 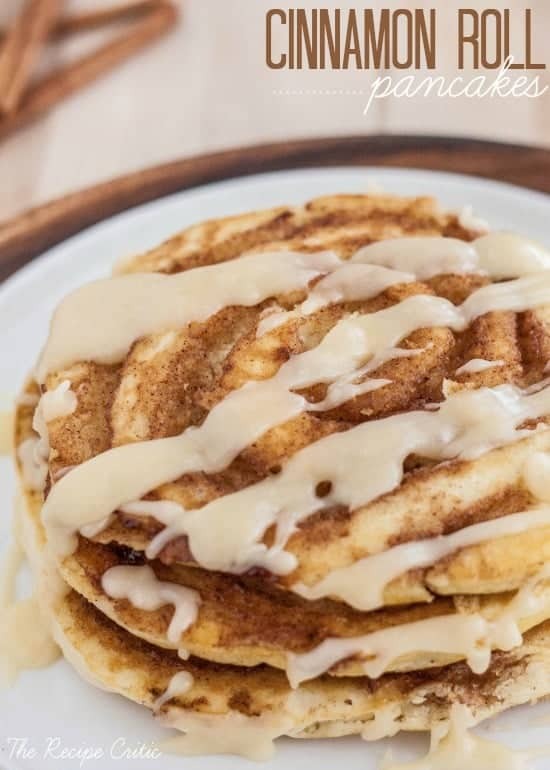 We love these, but we never liked that the cinnamon filling melted while cooking… so we started doing them taco style – cook the pancakes like normal, grab one, put a squirt of cinnamon filling across the radius, then a squirt of topping, fold and eat like a taco. We all liked that better! For me, all 3 recipe segments prepped & skillet heating. Can’t wait! I found this recipe on Pinterest, made it that morning for breakfast, and my kids immediately thought I was the best Mom ever! They begged that I include this into our breakfast rotation and sometimes dinner rotation, which I totally did. Thanks to my kids and their big mouths, I’ve had so many people in my neighborhood and in my ward ask for the recipe and all have loved it. I’m in the middle of making these… I just made the glaze and its not much of a glaze, more like a dough and it doesn’t taste very good. :/ help! If it is too thick you can always put it in the microwave and soften it up. It should taste amazing! It is our favorite part! Are you sure you didn’t use flour instead of powdered sugar? My daughter made these tonight and had a huge glob that looked like cookie dough and tasted awful. We realized she accidentally put flour in instead of powdered sugar! We both had a good laugh and started over and made it the right way with powdered sugar. It tasted MUCH better!!!! We both loved this recipe as well! These look marvelous. Going to visit my daughter and son-in-law for Christmas and will make this for breakfast. Will definitely make these here first to make sure. Thank you so much. Such a wonderful recipe! My whole family loved it… thank you sooo sooooo much for sharing! This took a little work to get the cinnamon swirl right, and the glaze ended up being more yellow than white, which was odd. However, it tasted WONDERFUL! Thanks for the recipe! All I can say is THANK YOU,,,I have never made a comment in the hundreds of recipes I have looked at and made. I own a hunting outfitting business. I made these to test them and they are now on my menu for the fall season. WOW!!!! these are wonderful. They had a little crispiness to them from the brown sugar mixture which was an extra bonus. You can double the cream cheese ,which I did…thank you for a wonderful recipe. I used box mix which did!! I can’t wait to try these! I was wondering if you still put maple syrup on top? We can’t decide if that would be good or not. Any help? Hope K,,no you do not need syrup!!!! Made these for dinner. My daughter wanted to know if I could come to college with her and cook for the whole dorm. Winner recipe as usual. Although if I waited until bubbly to add cinnamon filling, I would lose it all when flipped, so I swirled in on only 10 seconds after pouring the batter into the pan. I made this recipe with my own whole wheat pancakes and yogurt instead of cream cheese. I love them. My one year old loved them. My 3 and 5 year old would not touch them (the yogurt was not enough like frosting for them) I’d make them again but I kept burning the sugar just a heads up for others to watch the temp. 😉 Delicious recipe. Thank you. 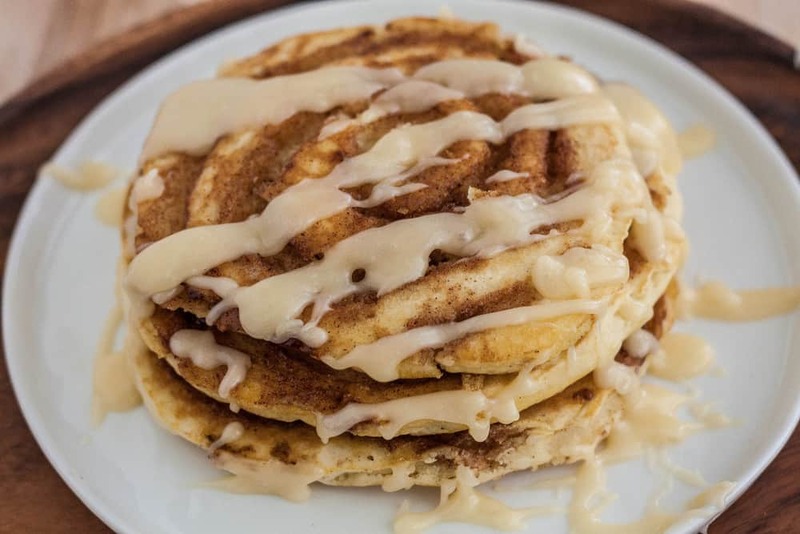 Ok so I just made these…I used Bisquick for the pancakes…they turned out amazing taste wise…but I could not stop the cinnamon swirl from basically evaporating while cooking…I even turned the temp down almost all the way to one but then they wernt cooking at all…what did I do wrong here??? In the end, I cooked them the best I could and then used the remaining cinnamon mixture to swirl over the done pancakes, then microwaved for about 45sec to carmelize the mixture…still turned out wonderful! Just made these for my Hubby and my 20 year old son. They loved them! These Cinnamon Roll Pancakes were delicious! The taste and texture were wonderful! We had a Mutual Activity last month and it was a pancake cook off against the Young Men, I helped my Beehives make these and we won hands down the most delicious!! I also was asked by many of the judges for the recipe!! I have since made them several times for my Family!! Awesome recipe! Made these today and they were awesome! I had a problem with the filling making a gross black mess on my griddle, and making holes in my pancakes where the butter melted, so after making two pancakes I decided to mix the cinnamon filling into the batter and it worked wonders! I also made my own glaze out of powdered sugar, butter, milk and a little bit of salt! I will totally make this again! I just made these. My cinnamon filling was thin and I used exactly the correct measurement of butter. I used corn starch to thicken it up which worked! Taste good, just was mostly as pretty as the picture! I also used Bisquik for pancakes also. I made this for my grandkids. The pancake batter was very good, I had a difficult time with the cinnamon filling. It would not move through my frosting bag and I used the largest tip that I had. The filling was very stiff and dry. Was i supposed to warm it up or cook it? I ended up crumbling the filling on top of the pancakes as they slowly cooked. It did create a hole type crater on the pancake. Please let me know what I can do differently to fix the problem with the filling. Batter was good and the topping was wonderful. I will be making this again when I find out how to fix the filling situation! Thanks for your help! I made these pancakes for my boyfriend, and I was slightly disappointed with the recipe. It definitely needs some tweaking to get it right. I did not read the review about putting a second layer of batter over the cinnamon layer, but I wish I had because it seems like a good idea. My brown sugar mixture came out rather thick and not as pretty as the picture. Also, my boyfriend is a real sweet tooth, but these pancakes were VERY sweet (no wonder the kids love it!) and the mix of all the sugar and butter was a little much. I would recommend trying this recipe out because it has a lot of potential and I love the cinnabon-play on a pancake recipe, but it needs some adjustments.